The Library’s new interim director Eniweta Yvonne Lavergne, usually known as Yvonne, got her unusual first name from her father’s service in the Navy in the Marshall Islands, where Eniwetok Atoll is famous as the site of the first H-bomb testing in 1952. Named after the Atoll, Yvonne spent most of her childhood in California due to her father’s naval career. She spent 32 years in the banking industry in San Diego, retiring as an Assistant Vice President for Union Bank where she managed the Employee Loan Department. She also spent two years after her retirement from Union Bank as a Consumer Loan Underwriter for another financial institution. In 2003 Yvonne moved with her husband Leon to Leon’s hometown: Mamou. There was much to do as they built their home and became active with family, church, and community. Always one to want to help others, she delivered meals to shut-ins for two years for the Council on Aging Meals on Wheels program. Then an opportunity arose to apply to work at the Evangeline Parish Library. Yvonne has been with the library since August of 2008, excelling in progressively more responsible positions. In October of 2011 she became the library’s business manager. She also soon began work toward her American Library Association LSSC, Library Support Staff Certification. She took online coursework in the foundations of library service, communications and teamwork, and library technology, as well as in other areas of library knowledge and service. Yvonne received her LSSC in December of 2015. It is a national accreditation recognized by all public libraries in the United States. 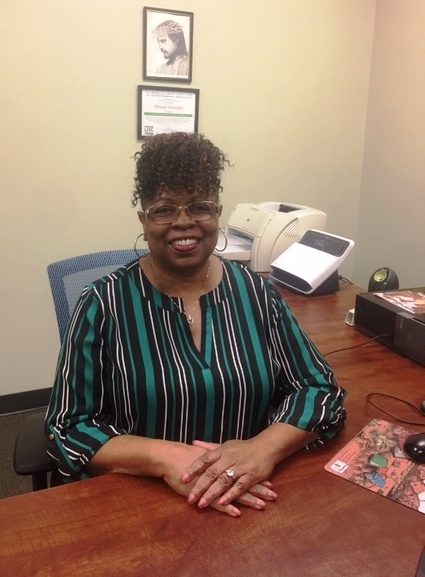 She has continued as library business manager but has also served in many other roles at the library as needed. She has been part of staff recruiting, training, and scheduling. She was also assistant branch manager for the Chataignier branch. Yvonne thanks the Library Board for the opportunity to serve as Interim Director. She says, “The staff here is Awesome,” and she will do her best to help provide all of Evangeline Parish with great library service.